Here's my card for the Less is More Challenge week 119 - it's a ONE LAYER week using a COLOURED CARD BLANK. It's absoloutely slinging it down with rain here consequently it's very dark and my base card looks a funny colour ...but it is bright yellow in real life!! 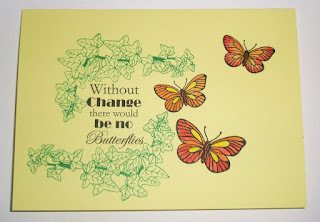 I've used Oak House Studio stamps - the Ivy Corner is stamped in Emerald Green Archival and the Without Change and Charming Butterflies are stamped in Onyx Black Versafine. I've coloured the butterflies with Inktense pencils and a waterbrush. I enjoyed creating this and having looked at it I may have got carried away and not left enough plain card. but I hope it will be OK. Thanks for looking and hope you all have a good weekend whatever you are doing!! Super card Elaine and what a fab sentiment! Sorry I'm a bit slow getting around to commenting this week but I've been on grandchildren duty since last Thursday!